Daniel Mittler is the Political Director of Greenpeace International and is on the steering committee of the global Fight Inequality alliance. BERLIN, Jan 18 2019 (IPS) - Four of the top five most impactful threats in this year’s World Economic Forum´s Global Risks report are related to climate change. The report warns that we are “sleepwalking to disaster” . But that is not true. Already this year, Thailand has seen its worst storm in 30 years rip through coastal areas. In the Alps, just east of Davos, extreme weather is causing snow chaos. The climate crisis also isn´t caused by sleep or ignorance. 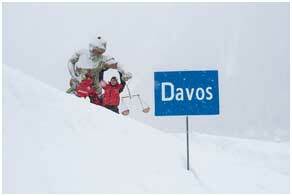 The rich and powerful gathered in Davos brought us to the existential brink wide awake. The “profit first” neoliberal economic model has dominated policy making around the world for too long. It has resulted in national laws, trade and finance rules that drive our current overconsumption of resources, lead to climate disruption – and bring about more and more inequality. The world’s richest 1% took home an obscene 82% of all new wealth last year and, according to the World Bank, almost half of all people worldwide are one medical bill or crop failure away from destitution. Inequality continues to rise as the world warms and the causes of both are linked. As Oxfam has shown, the richest 10% are responsible for almost half carbon emissions caused by consumption. And yet all around the world it’s the poor and marginalised that are most at risk from the devastating effects of climate change. The failure by governments to prioritize climate action and the fight against inequality is caused by state institutions and decision-makers – in South as well as North – being captured by specific corporate interests. The report Justice for People and Planet, for example, showcases 20 examples of how the rules that govern our global economy (and sometimes the lack thereof) result in environmental destruction and corporate human rights abuses. The sad truth is, that those cases are just the tip of the iceberg. They merely illustrate the systemic problem we face. Because the crises we face are the result of our current economic and political rules, neither the climate emergency nor inequality can be fixed by public private partnerships, as Klaus Schwab, the founder and director of the World Economic Forum tries to make us believe. To the contrary. We only have a chance to stop walking towards catastrophe if we force our governments to adopt new rules – nationally and globally – that have ending climate pollution and inequality at their heart. This is certainly possible. At the global level, we do have some regulations with teeth. The World Trade Organisation, for example, can sanction countries that break its rules. Those very rules have prevented many positive laws and changes – because the threat of the WTO overruling a social or environmental measure always looms. We need similarly strong rules to counter the climate emergency and to fight inequality. Environmental and social bodies should be able to impose sanctions and fines. Corporate accountability and liability needs to extend to all corporate impacts on people and the environment around the world. Trade rules, similarly, need to be revamped to put people and planet first. At the national level, we need binding targets to at least halve global emissions by 2030, and we need tax rules that ensure that the corporations and the rich pay their fair share. We can take heart in some rules that are already on the statute books. France, for example, requires corporations to identify potential risks to people and the environment as a result of their activities, and act to prevent harm to people and the environment. The UK’s Modern Slavery Act meanwhile require businesses to tackle slavery and human trafficking in their supply chains – one extreme part of the inequality crisis. We need more such laws, in more countries. Urgently. And that´s, luckily, what grassroots movements are demanding around the world. As the World Economic Forum gathers in Davos, January 22-25, people are mobilizing in many countries to put an end to inequality as part of the Fight Inequality alliance week of action. Feminists, workers, environmentalists and many more movements have come together in this alliance in the knowledge that we do not need nice words or acts of charity from the Davos elite but fundamentally different rules for our global economy if we are to survive. That world is possible. Via collective mobilization around the world we are making it a little bit more real every day.